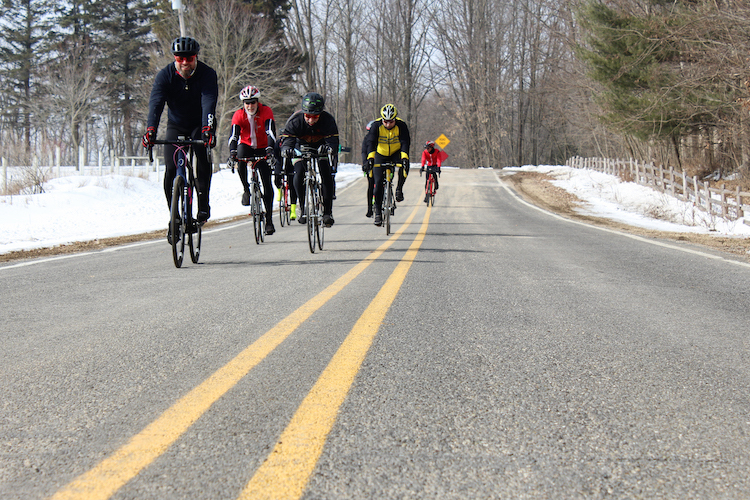 A group of cyclists rides through Mount Pleasant on March 9, 2019. 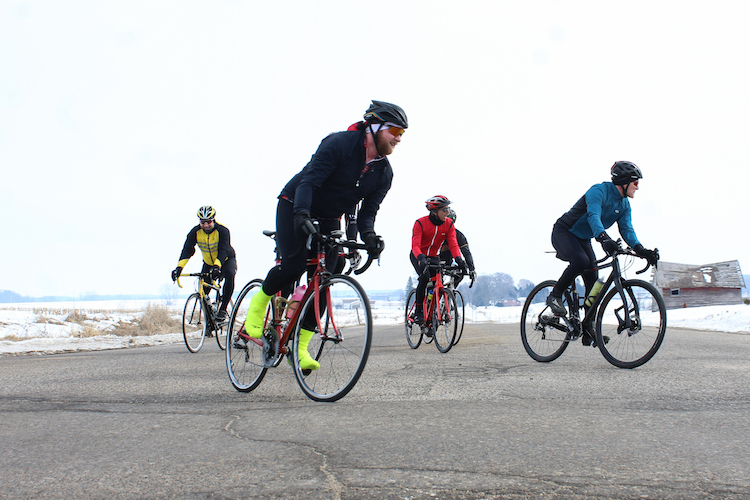 As the snow begins to melt and the first signs of spring stir the air, many people across Mid-Michigan are taking their bicycles out of the shed for the first time since putting them up last fall. Some people, though, like Jim Schmitt, never put them away. While some may call Schmitt crazy, the reality is that more and more people are choosing to use a bicycle as a form of transportation as well as a way to stay in shape. With more cyclists on the road, changes are in the works both at the state and local level to keep everyone safe. “Every spring, I get more people wanting to ride to work,” Schmitt says. Part of that, he says, is that some employers, such as the Dow Chemical Company, provide the internal infrastructure for employees to do so by providing a place to park a bike, shower, and change into work attire. Bicyle shops throughout Mid-Michigan are seeing this steady increase in the number of people using bikes as a form of transportation. “We have the college here and there are a lot of professors that ride,” says Mike Ring, owner of Motorless Motion in Mount Pleasant. The trend is getting noticed at some city offices and has officials thinking about what to do in order to help keep cyclists and motorists alike safe on the roads. Bill Mrdeza, Community Services and Economic Development Director for the City of Mount Pleasant, and cyclist, says the city recognizes that more and more people are electing to use bicycles as a form of transportation. Ring says he would like to see more people in the area using a bicycle as a form of transportation, and says he believes it would benefit the community as a whole. “With the college, there’s a lot of congestion; and, a lot of that congestion could be worked on just by having more people ride bikes around,” he says. With an increase in the number of people using bicycles as a form of transportation and cities like Mount Pleasant working toward making the roadways more user-friendly for them, organizations such as the Mid-Michigan Cycling Club are putting the pressure on at the state level for measures to be put into place to protect cyclists. Lisa Hadden, President of the Mid-Michigan Cycling Club, worked in tandem with other groups to get the Safe Passing Law accepted last year. The popularity of cycling in Mount Pleasant really picked up in 2009, after the Mid-Michigan Cycling Club hosted the Le Tour de Mont Pleasant 3-day professional cycling race, says Hadden. “Mount Pleasant has always had a cycling community, but I think that really made people think, ‘I can do this.’ I think that really inspired people to ride,” she says. Since then, cycling has continued to pick up popularity in the area and many of those starting out are doing so as a means to stay fit. “A lot of people have gone from getting fit to getting in a situation where they let things go. Cycling is a low-impact, low-cost, fun way to get back into it. I’ve seen people lose 120 pounds,” says Ring. While there are countless exercise programs, diets, and combinations of the two that are available to people trying to get healthier, Ring says one of the reasons cyclists see such success is because of the camaraderie that is ingrained in the sport. He explained that there are cycling groups that get together regularly to go on rides. Information about those rides are posted on the Mid-Michigan Cycling Club Facebook page. Hadden says there are groups for every level of cyclist – from beginner to expert – and if someone accidentally goes for a ride in a group that’s a little too difficult for them they still won’t be riding alone. While some may get into cycling for the physical health benefits, Damon Lowe, Shop Manager at Jack’s Bike Shop in Bay City, says cycling is about more than that. For those considering starting to ride their bike around this spring, both Schmitt and Biggs have a piece of advice. “Don’t think so hard on it,” says Biggs.